How to use Facebook persistent key stream key? Important: We strongly recommend to follow the Facebook streaming requirements, otherwise we do not guarantee the proper work for this service. Facebook accepts video in maximum 720p (1280 x 720) resolution, at 30 frames per second. (or 1 keyframe every 2 seconds). You must send an I-frame (keyframe) at least once every two seconds throughout the stream. Recommended max bit rate is 4000 Kbps. Titles must be less than 255 characters otherwise the stream will fail. 240-Minute maximum length, except continuous live (Learn More). 240-Minute maximum length for preview streams (either through Live dialog or publisher tools). After 240 minutes, a new stream key must be generated. Audio Sample Rate: 44.1 KHz. Audio Bitrate: 128 Kbps stereo. 2. Select a "Connect" tab on top of the page. And choose "Persistent stream key". Persistent stream key allows you not to update the stream key each time, every time you create a new event and choose persistent stream key your stream will go there as soon ans you start it and you only need to post it! 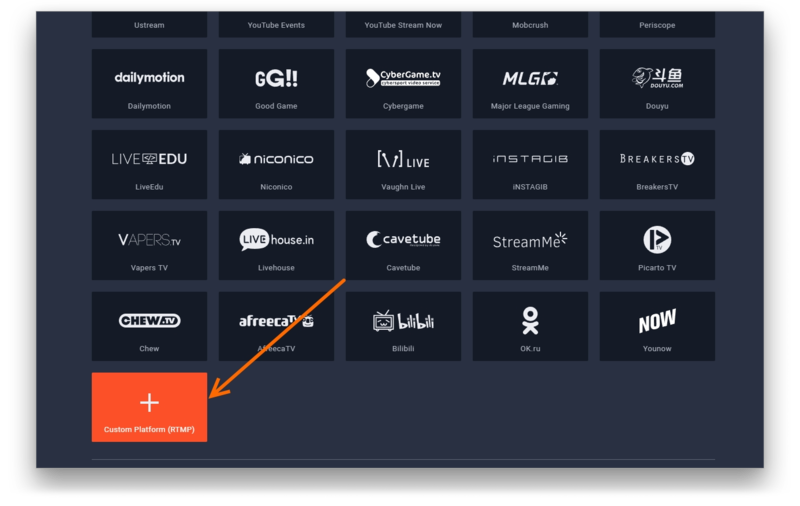 And the process is basically the same, except you need to choose and use this key at Restream and there is no need to update it as soon as your event sent to "Persistent stream key" it will fetch your stream, if it's going. 3. Fill your Stream Details into the spaces provided: Post, Title, Game, etc. 4. 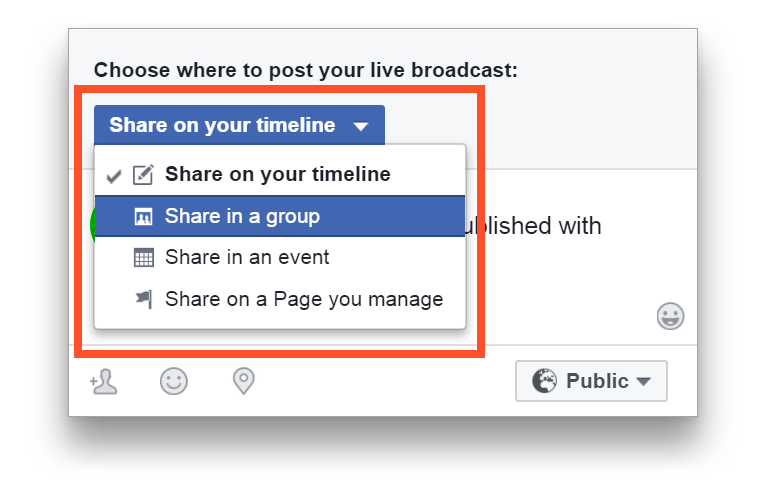 After that, select where your stream will appear on Facebook. 5. 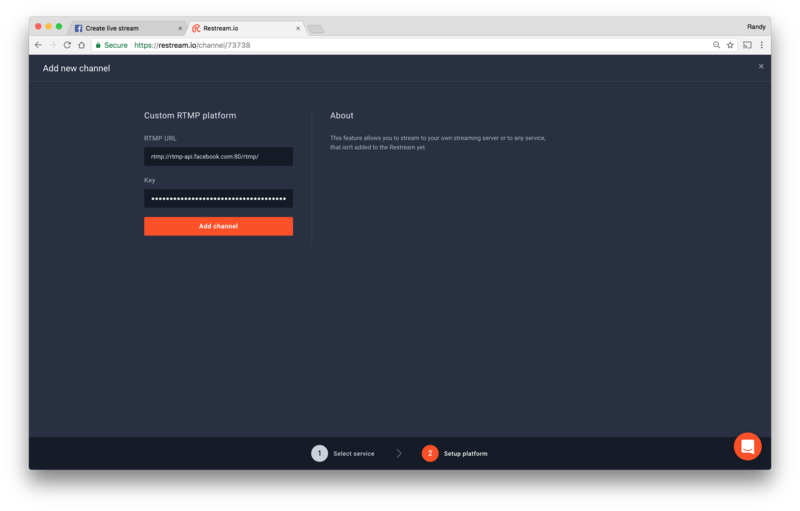 Go to Restream.io and chose "Custom platform" from the bottom of the "Add Channel" list. 6. 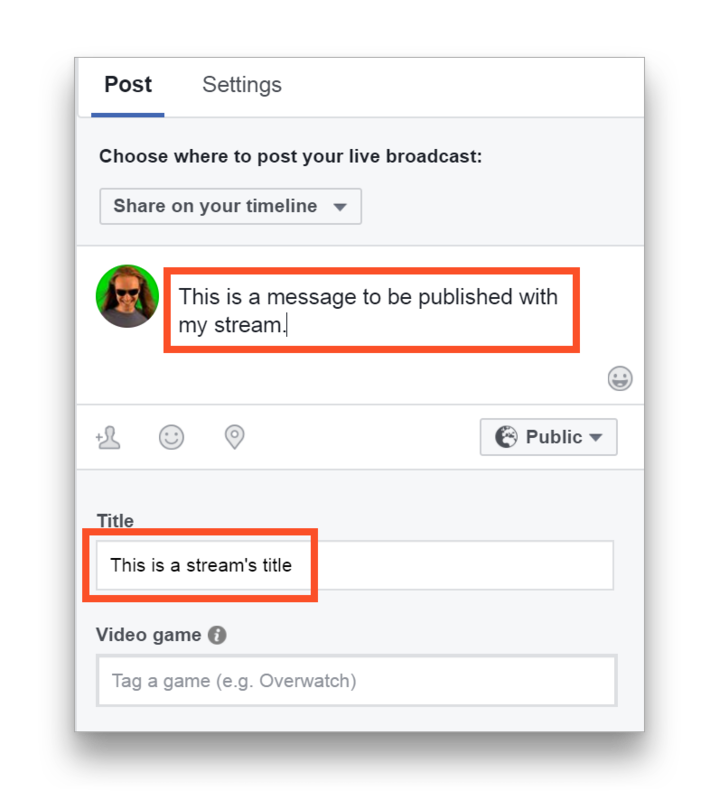 Paste the Server URL and Stream Key you received from Facebook in the spaces provided. 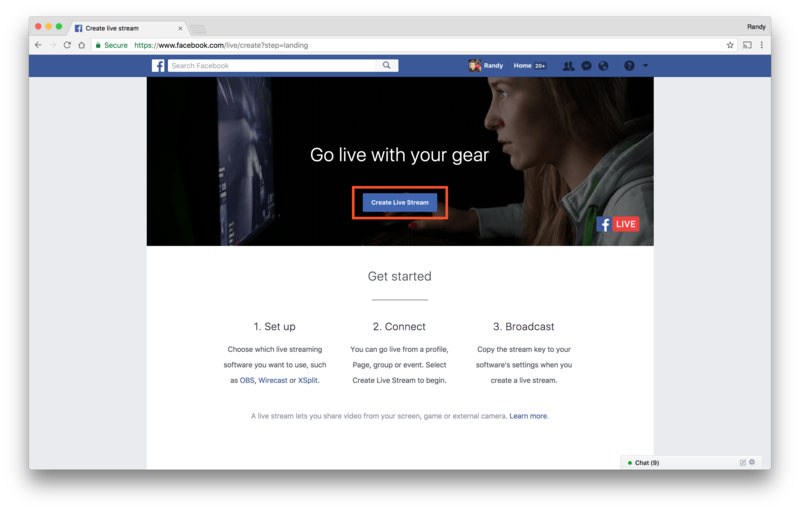 TIP: The Facebook Server URL goes into our RTMP URL space. 7. Click on "Add Channel" and go live from your encoder. 8. Once you are Live on Restream, you will see your Stream Pop up on the Facebook Stream Page we were using earlier. Once you see your stream, choose "Go Live"
TIP: The Go Live button remains disabled until a valid stream from the encoding software is detected. If you receive a "Stream is offline" message, make sure you have started streaming from your encoding software. If you still have issues, check the server url and/or stream key were copied correctly. You can reference the server url and key anytime in the tab. For more information, please check out Facebook's Setting up Guide. Tip: It is crucial that you set your Key Frame interval to "2" within your Broadcast software when streaming to Facebook; if you don't set you Key Frame to "2" your stream on Facebook may appear as a black screen. Click here to head to our Knowledgebase search engine. Would like to learn some tricks from the community?Please join our Discord.